Healthy Choice steamed lunches are presented as “honest to goodness” value in a series of television commercials set in work environments where everyone says exactly what they’re thinking. Three commercials, set in a law firm, customer service centre and DMV (Department of Vehicles) service centre, remind us how rare it is to find that honest to goodness quality. 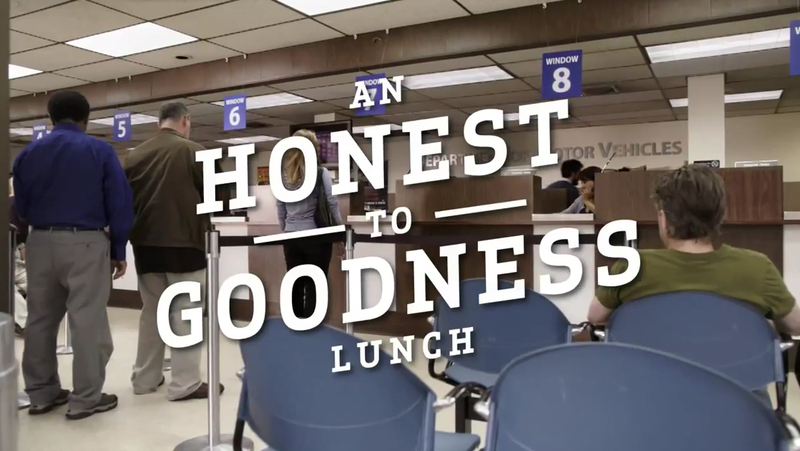 The Honest to Goodness campaign was developed at Sapient Nitro New York by chief creative officer Kathy Delaney, creative directors Scott Higgins and Chris McMurtrey, art directors/copywriters Annie Chiu and Anna Echiverri. Filming was shot by director David Shane via O Positive Films with producers Margaux Ravis and Ken Licata, executive producer Marc Grill, and head of production Andy Wilcox. Editor was Tom Scherma at Cosmo Street. Sound was mixed at Sonic Union.